A Kiwi devoted to coffee in Phnom Penh and a hotel devoted to tea | Fancy a Cuppa? 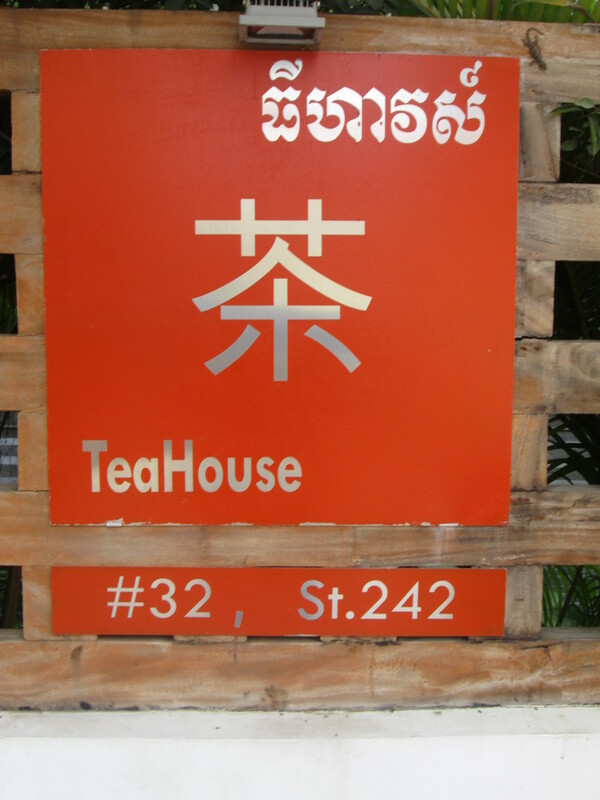 We were delighted with the places we found for coffee and tea in Phnom Penh. The Feel Good Coffee Roastery is the kind of place we’d be going to every morning if we lived in the Cambodian capital. And as it was, by the time of our second visit there, we were already beginning to see familiar faces among both the staff and the customers, which is always a good sign for a local coffee shop. But Feel Good ticked many more of our boxes, too. They roast the beans on-site, they source as locally as possible, with coffee from Cambodia, Laos and Thailand, and owner Mark has set up a fantastic business structure where his baristas part-own the place. And I respect Mark’s decision to go with locally-grown coffee, even though it’s mostly the coarser Robusta bean, and to make the best coffee he can out of that rather than going for imports from far away. It’s a philosophy we both share in a world where air miles are doing about as much damage to the environment as anything else these days. His cappuccino with an Arabica-robusta blend was a pretty good coffee, though you could pick up the robusta fairly quickly on the first sip. What was especially exciting, and you could see the passion in Mark’s eyes when he spoke about it, was that just a week or so before our visit they had sourced a really good single origin tipica bean from Laos. This was a fantastic coffee, and I appreciated the patience of all the Feel Good staff, who were willing to grind just enough for my one cappuccino each time we visited. We could see also how the staff co-ownership idea pays off; there’s a real pride in everything the baristas at Feel Good do; Sophorn came 2nd in the national barista championships last year and was enthusiastically telling us where to go in Battambang and Siem Reap once he could see we were gluttons for more good coffee. Of course, Mark being a New Zealander means there has to be carrot cake to have with your coffee. And, yes, we can confirm, the carrot cake at Feel Good is well worth having. What a great place. And what’s more, they have a spa upstairs with massage and other treatments. Plus a big kitchen where they have started not only cupping and tasting, but Khmer cooking classes. Feel Good really is all about feeling good. The best thing of all, as we sat and drank in the atmosphere on the sunlit terrace, was to realise how far Cambodia has come in the 16 short years since Pol Pot died. It feels extraordinary to think that only 20 years ago, people were fearing a return of the Khmer Rouge, and now we are able to sit peacefully enjoying a cappuccino and carrot cake. Hats off to Mark and all his team for a fantastic coffee shop in Phnom Penh. Tea in Phnom Penh was also pretty special. Sadly the Tea House Hotel had no rooms available for the nights we were in town, but we did manage to go there for afternoon tea. This is the first time I had ever seen a tea-themed hotel. Apparently the Cambodian-French owner is a great tea enthusiast, so when you walk into the airy open hotel lobby you have tea canisters on all the shelves beside you. And then over in the restaurant area – by the hotel pool, indeed – you can take afternoon tea. High Tea is available only from 2pm to 5pm, but that suited our needs so we turned up there just after lunch, escaping from the Phnom Penh heat. There’s a nice selection of teas on offer – from the very good TWG in Singapore – with an English Breakfast, a Darjeeling, a Puer, various oolongs and a Moroccan Mint, not to mention the green teas. And then there’s a wonderful tiered stand for the food. It’s an exotic mix, too, with spring rolls, quiche, small sandwiches, cakes, scones and brownies. They’re all bite-size portions, but the overall amount is more than enough even for hungry stomachs. And there’s a nice transition up the tiers from savoury to sweet, with the middle tray providing some fascinating local traditions, including a Cambodian layer cake in a fabulous green colour (though we didn’t catch the name of the leafy plant it is supposed to be from). With the breezes blowing through the hotel lobby and over the hotel pool, this was a great place to while away the afternoon. And at about US$8 a head, it’s fantastic value for money. Who’d have thought you’d get such good afternoon tea in Phnom Penh. What would Pol Pot have made of that? This entry was posted in Asia Visits, Cambodia, World visits and tagged afternoon tea in phnom penh, arabica-robusta blend, cambodian layer cake, carrot cake, coffee from cambodia, coffee in phnom penh, coffee shop, coffee shop in phnom penh, feel good coffee roastery, high tea, khmer cooking classes, locally-grown coffee, roast the beans on-sit, tea house hotel, tea in phnom penh, tipica bean from laos, twg in singapore. Bookmark the permalink.